"Jalacy Hawkins" better known by the stage name "Screamin' Jay Hawkins" born and raised in Cleveland, Ohio, in July 18, 1929, was a Rhythm & Blues musician, singer, songwriter and actor. In the early 1950s, "Hawkins" worked such artists as "Tiny Grimes" and "Fats Domino" before striking out on his own. In 1956, "Jalacy Hawkins" entered the studio, planning to record a blues ballad he had been performing live with some success. Producer Arnold Maxon had other ideas, and to fulfill them, he brought plenty of alcohol and food and alcohol (not to mention alcohol) into the studio. Hours later, Hawkins staggered up to the microphone and unleashed one of the rawest, bloodiest, most gut-churning vocal performances ever delivered, one that he couldn’t even remember giving the following day. The ballad-turned-reverse-exorcism was banned in radio stations nationwide (they claimed the blast of demented gibberish at the end simulated cannibalism), and the song never charted. Didn’t matter. 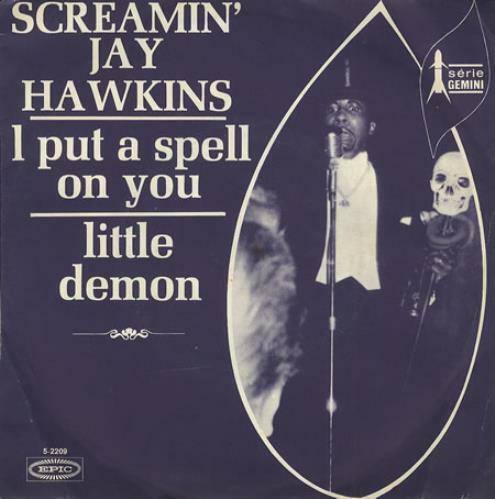 "Jalacy Hawkins" would forever after be "Screamin’ Jay Hawkins", and “I Put a Spell On You” would be his raucous calling card. "Hawkins" wrote this as a ballad lamenting the loss of a girlfriend he wanted back. The original version was a lot slower and much more tame. "Hawkins" was recording for Grand Records at the time, and had a hard time convincing them to release this. A year later, Hawkins recorded the version that became famous for another label, and transformed the song into a spooky tale about putting a curse on the girl so he can have her. "I Put A Spell On You" has been used in American TV commercials for McDonalds, Burger King, Pringle's Potato Chips and Levi's jeans. The song ranked #313 on Rolling Stone magazine's list of The 500 Greatest Songs of All Time, and selected as one of the Rock and Roll Hall of Fame's 500 Songs that Shaped Rock and Roll. Screamin' Jay Hawkins: "I came into this world black, naked and ugly. And no matter how much I accumulate here, it's a short journey. I will go out of this world black, naked and ugly. So I enjoy life".